Around 2,000 athletes will see action in one of the country’s biggest national taekwondo events—the 2018 SMART/MVP Sports Foundation age group (free sparring) and PLDT HOME ULTERA age group (poomsae) championships on November 10 and 11 at the Rizal Memorial Coliseum. Quezon Taekwondo Academy’s Paul Jacob Daejeon (left) and Team Baguio’s Rodolfo La Torre III trade high kicks during their taekwondo match. 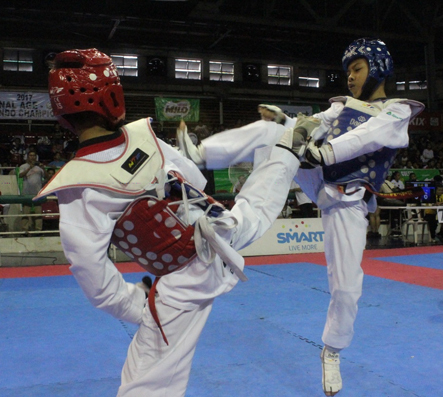 The competition highlights the progress of Philippine taekwondo throughout the country. The twin events will also serve as a vital support to the grassroots sports program as these will also feature participants as young as 4 years old. The tournament will be categorized into Novice and Advance male and female free sparring hopefuls competing in three divisions under each category namely Junior, Cadet and Gradeschool. But poomsae (which means forms), will feature only blackbelt students who will vie in three events—Individual, Pair and Team. Poomsae is performed by following a systematic time of movement in consecutive consequences against an imaginary opponent/s. The different movements use the hands and feet and interconnected techniques like blocking, punching, striking, thrusting and kicking. Constant poomsae training will help improve flexibility and control in breathing, balance, power, eye focus and mental discipline. Competition will start at 9 a.m. but the opening ceremony is scheduled at p.m. on Nov. 11. Martial arts enthusiasts and sports buffs especially children interested to learn the sport are invited to watch the event also sponsored by Meralco, Philippine Sports Commission, Philippine Olympic Committee and MILO.